I’m a sheet music junkie. I love getting my hands on a new piece of sheet music, opening it up at the piano and attempting to play through it (not always successfully). I guess it’s like an avid book reader acquiring a new book and wanting to “tear through it” right away. For me, seeing all those notes on the page that someone at some point in history took the time to create and right down, to preserve their musically creative thoughts so that someone else might enjoy it one day down the road . . . it’s like entertainment, history and even exercise (because some pieces are a workout!) all rolled up into one exquisite package. But that’s me. I have always collected sheet music and, frankly, I’m a sucker for a new piece of music. But “new” doesn’t necessarily mean “mint” or “pristine”. In fact, I particularly enjoy when a new piece of music is a used piece of music. Part of the joy of discovery is finding the written history left behind by a former owner of that music; those little penciled in notes that reveal practice habits, musical preferences, and sometimes historical and personal anecdotes. It’s like musical archeology! Also printed music, like many other things these days, can be expensive. Especially if you’re looking for an Urtext edition or something that’s no longer in print. I remember one post-grad class I was in, I paid $275 . . . FOR ONE BOOK! And we only used a tenth of the book for the class! Couldn’t I have paid $27.50 for the pages I needed and return the rest? Guess not. So used music and books is a great option. This stuff don’t grow on trees, you know! So much music has already been printed on paper from our world’s natural resources. Sure we can recycle it, but wouldn’t it be better just to save it and USE it? Save a tree with used sheet music! Preserving a piece of history. Okay, I admit not every piece of “history” is worth saving (have you read the lyrics to MacArthur Park recently? ), but much of it is. And if you can bring a piece of music history into your home while getting good use out of it, BONUS! 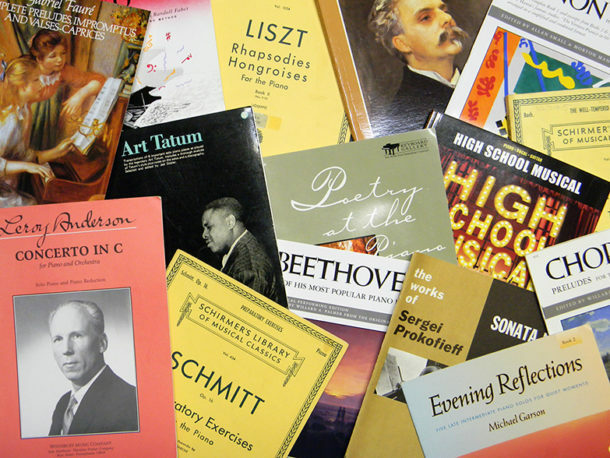 Save a piece of history with used sheet music! Art for music’s sake? The “art” of designing sheet music covers and music notation itself has declined over the years. Don’t get me wrong, I enjoy using music notation software just as much as the next composer. It’s an excellent tool and looks terrific. But looking back through the years of sheet music publishing you find all sorts of music fonts, artwork, photography and just some really cool graphic design. Some of it is even worth framing, in my opinion (I have a few sheet music items framed myself and displayed in my home studio). Decorate your home with used sheet music! Bless others. I believe in giving back a portion of what is given. When I acquire used sheet music, I go through it with the mindset that what I can’t use can be passed on to others. Sometimes this means resale, but often it means passing on certain items to others (in particular to music students). Bless others with used sheet music! One last thing: I am a composer and pianist myself and have included a section on this site where you can purchase my music (via electronic download). It’s not used music and it may fly in the face of what I just wrote above. But I have had many people ask me to provide some of my work in sheet music format and this seems like a logical enough platform. Who knows? Maybe one day 100 years from now someone will find a copy of something I wrote, open it up at the piano and play through it, and maybe . . . just maybe . . . they’ll experience a moment of joy from playing and hearing it.